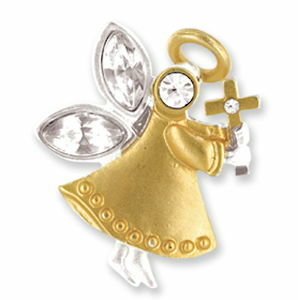 Angel of Faith Guardian gold angel pin holding cross and Crystal Rhinestones wings, gold. 1 inch tall. 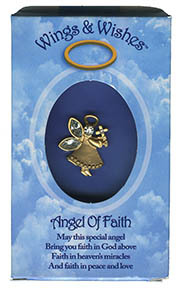 Wording "May this special angel bring you faith in God above. Faith in heavens miracles and faith in peace and fear." Space for To: From: on back. Nice gift box. Newer design.